Cashier’s checks are checks that a bank issues and guarantees. Your bank or credit union prints a document with the name of the recipient (or payee) and the amount, and the recipient uses that document to collect funds from your bank. When compared to personal checks, a cashier’s check is a safer form of payment for sellers because the check cannot bounce. Guaranteed funds: When a bank prints a cashier’s check, the bank takes money from the person requesting the check (or from their account) and sets that money aside. As a result, the bank can guarantee that the check will clear. This provides security to the recipient, who is often selling something. With a personal check, on the other hand, a check will only clear if the funds are available in the check writer’s account when the recipient tries to deposit or cash the check. Quick availability: After depositing a cashier’s check, the recipient or seller can use the funds almost immediately. The first $5,000 typically must be made available within one business day (compared to the first $200 for personal checks). Banks are allowed to hold amounts above $5,000, but cashier’s checks usually clear much faster than personal checks. Order cashier’s checks from your bank or credit union. Request the check: Ask your bank about the requirements to order a check. You’ll either need funds available in your account, or you’ll need to bring cash to the bank. In person: You can walk into most brick-and-mortar banks to get a check issued. Within a few minutes, you should have a check in hand, and you can pay the recipient immediately. Online: Some banks—particularly online banks—allow you to request cashier’s checks online. The bank might only mail checks to your verified mailing address, so you need to wait for the check and then forward it to the ultimate payee. Be prepared: Your bank needs several details to issue a check. Check amount: You need to tell the bank exactly how much the check is for. This will be printed on the check and cannot be changed. Payee: Provide the name of the payee (the person or business the check should be payable to). Other details: You can add a "memo" or notes on the check. For example, you might include an account or reference number. Identification: If you visit a bank branch in person, bring valid identification (a driver’s license, passport, or other government-issued ID). Fees: Expect to pay a modest fee for cashier’s checks. Banks and credit unions typically charge around $8 or so per check. To cover that cost, you need extra money in cash, or available in your account. If you’re making the payment out of your account, the funds will be removed from your account immediately when the check is printed. Again, a cashier’s check is a form of guaranteed funds, so your money moves over to the bank’s account until the check gets cashed or deposited. Credit union members: If you use a credit union, you can often get cashier's checks from almost any credit union location (not just your own credit union) with shared branching. Bring ID and information about your “home” credit union. Call ahead to be sure the credit union you plan to visit provides cashier’s checks. If you don’t have a bank account: You can walk into any bank or credit union and ask for a cashier's check. However, some institutions only issue checks for customers, so you may have to try several different locations (or open an account). You could also try a money order instead. Cashier’s checks are sometimes called bank drafts. When they’re legitimate, bank-issued documents, cashier’s checks are relatively safe. Traditionally, sellers view those checks with confidence because the bank promises to pay—not just the person who hands you the check. But that safe reputation allows con artists to steal money. Somebody sends you a cashier’s check. Something odd happens (they send too much, they send extra for shipping, or their “plans change”). They ask you to send money back to them, or to somebody else. Your bank assumes the check is valid and allows you to withdraw the funds. The check eventually comes back as fake. Your bank reverses the deposit, and you owe your bank money. After you send money to a thief, you have no recourse except to try and find the individual yourself—which isn’t easy. For full details, read How Cashier’s Check Fraud Works. As a result of these scams, some banks are reluctant to cash cashier's checks. Federal regulations allow banks to place a hold on amounts above $5,000, and banks can refuse to honor a check altogether if there is any reason to believe it's fake. Banks may also refuse cashier's checks more than 90 days old. When you write a personal check, you’re supposed to have enough money in your account to cover the check. But (besides the fact that it’s illegal) nothing is stopping you from writing a check without the funds available. You may know that your check will be in the mail for a few days, that it will take the recipient a day or two to deposit the check, and that processing the deposit will take another few days. Therefore, your account won’t be debited for several business days after you write the check. If you don’t have the funds available today, you can always hope that they’ll be there when it really matters—when the check is presented to your bank for payment. So, you can write the check anyway, and you can probably walk away with merchandise in your hands. That practice is called floating checks. If it sounds illegal, that’s because it is. Unlike personal checks, cashier’s checks pull from your account when the bank issues the check. As a result, you can’t get a cashier’s check unless you actually have sufficient funds in the account or you bring cash to the bank. Once the bank prints the check, the bank becomes responsible for paying the payee, and it's difficult to cancel the check. As a merchant, which would you rather get—a cashier’s check or a personal check? Of course, your odds of being paid are better with a legitimate cashier’s check. Money orders are similar to cashier's checks. They are considered "safe" forms of payment because you can only purchase them with cash (or cash-like instruments such as a debit card or cash advance on a credit card). As a result, they don’t bounce (or get returned unpaid) like personal checks. But money orders come from different issuers. In addition to banks and credit unions, you can also buy money orders at post offices, retail stores, and money transfer businesses. Money orders come with maximum issue limits, so they might not be useful for significant expenses, like home purchases, but they may cost less for small payments. For more details, read about the differences between money orders and cashier's checks. There may be times when you don't know who to make a cashier's check payable to. In those cases, you may need some extra creativity or patience. It's unlikely that the bank will issue a cashier's check with the payee name left blank, and the same goes for getting a check made payable to "Cash." Once a cashier's check is issued, the bank is responsible for it, and most banks are unwilling to hand out blank checks. 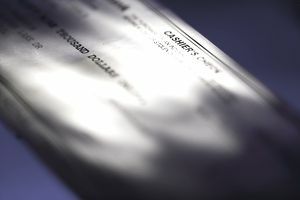 Because of their relative safety, cashier’s checks are typically used for high-dollar transactions and payments between people (or businesses) that don't know each other. Instead of hoping that your buyer has funds available in their checking account, you can be more confident that a bank has enough cash on hand to pay what you need. Cashier’s also work for transactions where the money needs to settle quickly. When you deposit a check, you might see the money in your account, but you can't withdraw all of that money until the bank "clears" the deposit. With personal checks, that might take several weeks, but with cashier's checks and government-issued checks, the funds are typically available within one business day. In a real estate transaction, nobody wants to wait for processing on a personal check. Again, it’s a significant amount of money—so down payments are often made with a cashier's check or wire transfer. Likewise, brokerage firms may require settled funds for certain transactions, and cashier’s checks can be used to satisfy that need.